UN Day – Important information! We look forward to welcoming our parents to join us for our school assembly celebrating UN Day on Friday November 30 at 10.30am. CAMPUS ENTRY: In addition to the main gate, Gate 5 will be open until 10.30am for campus access for parents with badges. Any parents without badges must sign in at the main gate. If you do not have a campus ID badge order it to day online and it will be delivered home with your child before Friday November 30. Find out how to order your badge online. PARKING: Parking is extremely limited so please plan to come to school in a taxi or have your driver drop you and come back later to collect you. SEATING: Please arrive promptly by 10.20 take your seats in the Sports Centre. The doors will closed at 10.30 and will not re-open until after the Parade of Nations. Parent seating will be in the central blocks downstairs or for a better view, plan to take your place on the upstairs balcony. UN Day is a special day of thousand photos! and this year we will have double the photo booths and double the fun! But please also read down to our photo etiquette guidelines for the UN Day assembly to be sure that capturing your memories is not upsetting others. Thank you! This year we will continue on with our popular photo booth activity with even more options! We know how much you love posing with your friends, family and flags so we have organised an additional photo booth to capture those precious UN Day moments. Type: Photo booth with photographer. Photo printing/email service available. Type: Flag waving photo booth with photographer. This year the photo booths will be self-managed. Please queue and place flags back into the labeled slots. As usual, all photos will be available in Tin Tuc. 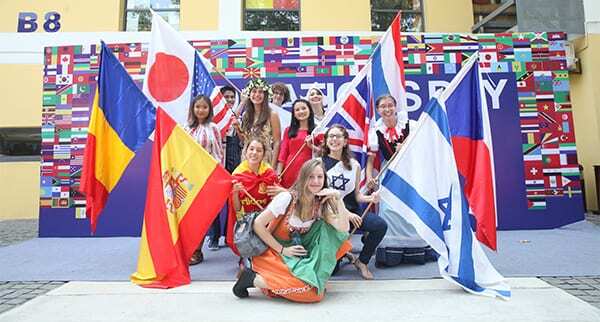 Flaunt your UN Day photos using #UNISHanoi #UNDay ! Our UN Day Assembly is a very photogenic event and we all want photos of our kids on this special day… but please be aware of photo etiquette. A team of photo professionals will be capturing the day to share with our community and the entire Assembly will be live streamed and published on the UNIS Hanoi You Tube channel. Watch for the link in our final reminders email on Monday. Enjoy the ceremony in THE PRESENT. Experience it LIVE happening in front of you, don’t distance yourself by watching the ceremony through a digital device. Be aware of people behind you when taking a photo, don’t block the view from others around you. It’s a crowded event already and we all want to see the ceremony. Leave aisles clear for the Flag Parade and be careful around the Elementary students seated on the floor! iPads and even iPad-Mini’s are notorious for obstructing the view (even their covers block the view). If possible, please take photos or recordings on a smartphone or a small digital camera.